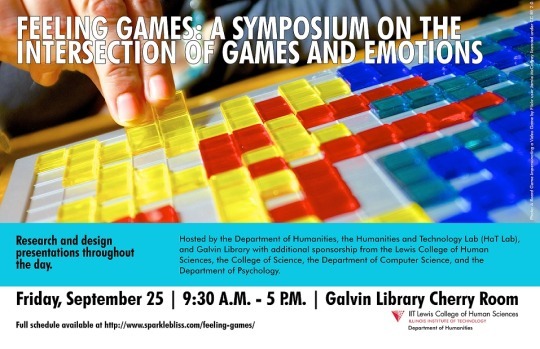 The Feeling Games symposium will be held on Friday, September 25, 2015 from 9:30 a.m.-5 p.m. in the Cherry Room of Galvin Library. Feeling Games is a symposium on the intersections of games and emotions hosted at the Illinois Institute of Technology by the Department of Humanities, the Humanities and Technology Lab (HaT Lab), and Galvin Library with additional sponsorship from the Lewis College of Human Sciences, the College of Science, the Department of Computer Science, and the Department of Psychology. It was organized by Carly A. Kocurek with assistance from Michael De Anda. Feeling Games is a one-day event intended to spark cross-disciplinary conversations about the intersections of games and emotions. How, for example, do game designers work with players’ emotional responses? How might we understand gaming communities through the lens of affect? Are empathy games a genre, and, if so, what defines this genre? In short, how are we to make sense of the diverse emotional experiences to be had in and around games?